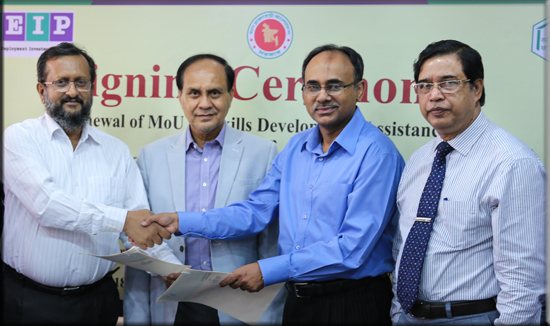 Palli Karma-Sahayak Foundation (PKSF) and the Finance Division, Ministry of Finance, Government of the People’s Republic of Bangladesh signed a renewal of Memorandum of Understanding (MoU) today, June 26, 2018, to implement the 2nd phase of the Skills for Employment Investment Program (SEIP) project. In the presence of Mr. Md. Abdul Karim, Managing Director of PKSF (Former Principal Secretary) and Mr. Jalal Ahmend, Additional Secretary and Executive Project Director (SEIP), Finance Division; Mr. Abdur Rouf Talukdar, Additional Secretary and National Project Director (SEIP), Finance Division, and Mr. Md. Fazlul Kader, Deputy Managing Director (Program) of PKSF signed the MoU in PKSF. The goal of the project is to develop demand-driven workforce through skills training and thereby placing at least 60% of the participants in more productive self and wage employment at home and abroad, which eventually will help improve their livelihood. The project is financed jointly by the Government of Bangladesh, Asian Development Bank (ADB) and Swiss Agency for Development and Cooperation (SDC). The totalprojected budget of PKSF for this phase is BDT 62.84 crore. PKSF will receive the total amount as grant through the government. Under this agreement, PKSF will provide skills training to 12,000 new entrants by 2020. Participants, after completion of their training will also be offered job placement services. The project will be implemented across the country through recognized training institutions. PKSF will select program participants from the disadvantaged youths under its microfinance programs through its Partner Organizations. The 2nd phase of the project will be completed within three years. In the 1st phase of the project implemented from 2015 to 2017, 10,000 participants received skills training in different trades and 71% of them secured jobs already. Out of this job recipients, 34% are self-employed. Mr. Md. Kamal Hossain, DPED (Public), Mr. Md. Rafiqul Islam, DPED (Fund Management) and Mr. Md. Fazlul Bari, DPED (Private) of SEIP project, Ministry of Finance and Mr. Md. Abul Kashem, Project Coordinator of SEIP, PKSF among others, were present in the MoU signing ceremony.